How many tried-and-tested small spaces tips can you list down? From using multipurpose furniture to opting for light, neutral colors—many homeowners have worked on these must-dos to be able to create a bright and functional condo unit. While you can strictly follow a couple of rules when completing your home, steering away from a familiar path can give you a unique space, too. 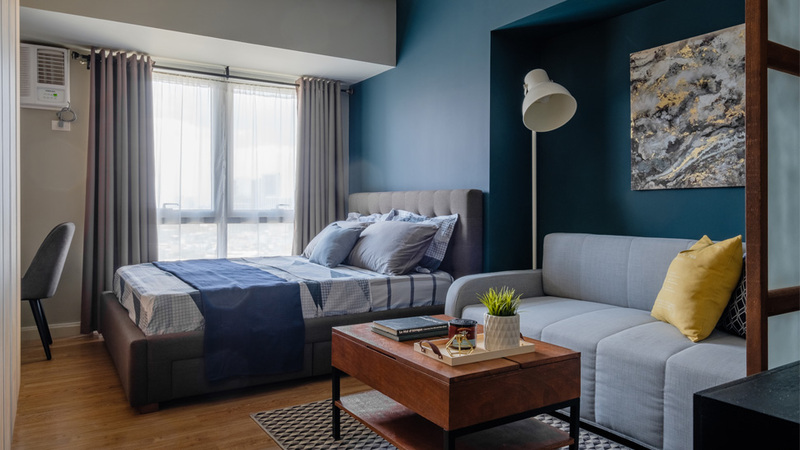 In designing this 35sqm bachelor’s pad in Makati, interior designer Nicca Sarmiento had to consider the owner’s pegs and how she can maximize the available space. “Since the client is a young professional, he wanted to have a bachelor’s pad feel that is also homey and with a hotel-like relaxing vibe,” she shares. After reviewing the pegs from the owner, Nicca came up with an urban modern concept that combines contemporary, industrial, and organic modern touches. “I aimed for a very hip and edgy aesthetic, but softer and still timeless with the use of wood and upholstered pieces. The style draws inspiration from city living with the main goal of giving a relaxing home after a long day at work. It also has a bold and daring color scheme which is not typical in small condo units,” the designer explains. After the renovation period, the owner now has a cozy space that perfectly marries unexpected small-space ideas and go-to hacks you can always count on.